The life of Jesus is at the heart of the Christian faith, and is also one of the great works of Western literature and philosophy. This book presents the story in a new form, more accessible than ever before. It weaves the four separate gospel accounts – Matthew, Mark, Luke and John – into one continuous story. And it presents the story in a new translation, traditional but always clear. 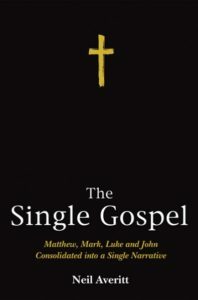 The Single Gospel is a “harmony of the gospels” or a “gospel harmony.” In it the reader can find the episodes combined into a clear narrative sequence. The nativity at Bethlehem is followed by the visit of the wise men. And for each scene the rich details are collected from all the gospel accounts, giving a complete picture of complex events like the Sermon on the Mount or Jesus’ climactic encounter with Pilate. The new language is clear as well. It is traditional scripture inconspicuously updated for modern readers, supplemented with contemporary language for difficult concepts, and where appropriate using the grand and familiar language of the King James. Low-key explanations smooth the transitions. Short footnotes explain the key concepts, and longer endnotes provide additional depth. This book opens the gospels to everyone—Christians who want to better understand their faith, and general readers who want to rediscover a great work of literature. The book can be purchased by clicking on any of the buttons below — which will take you to the websites of the publisher Wipf and Stock, or of Amazon, Barnes & Noble, or your local bookseller. 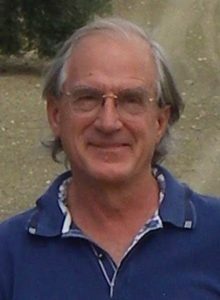 Neil Averitt is a writer and editor, from a family that has produced many clergymen over the years. After a secular childhood, he rediscovered the possibilities of faith while visiting the monastic republic of Mount Athos. He then learned Greek, and applied his skills as an editor and lover of traditional language to bring to life this consolidated narrative of the gospels. For an account of the intellectual and spiritual journey that led him to undertake this project, see The Author’s Introduction from the book. 1. But many people saw Jesus and the disciples going across the water, and recognized them. The crowds ran after them on foot from all the towns, because they had seen the miracles which Jesus performed on those who were sick, and they got to the landing place ahead of them. 2. As Jesus went ashore he saw the great throng. But before addressing them he went up into the hills, and there sat down with his disciples. It was almost time for the Jewish feast of the Passover. 3. When Jesus looked up and saw that the great multitude was coming toward him, he had compassion on them, because they were like sheep without a shepherd; and he began to teach them many things. He welcomed them, and spoke to them about the kingdom of God, and cured those who had need of healing. 7. Jesus said, “Bring them here to me.” And he said to his disciples, “Have all the people be seated in groups, about fifty each.” And the disciples did so, and had them all sit down. Now there was an abundance of green grass in that place, and the men sat down on it in groups, by hundreds and by fifties. 8. Then taking the five loaves and the two fish, Jesus looked up to heaven and blessed the food, and broke the loaves, and gave the loaves to the disciples, and the disciples gave them to those who were seated. He did the same with the two fish, as much as they wanted. And the people all ate and were filled. 9. And when they had eaten their fill, he said to his disciples, “Gather up the fragments that remain, that nothing may be wasted.” So they took them up, and they filled twelve baskets with pieces from the five barley loaves and the fish, which were left over by those who had eaten. And those who ate were about five thousand men, besides women and children. 2. They answered him, “If this man were not a criminal, we would not have brought him before you.” Pilate said to them, “Take him yourselves and judge him by your own law.” But they said to him, “We do not have the authority to put anyone to death.” This happened to fulfill the words Jesus had spoken, when he revealed the kind of death he was going to die. 5. But to the accusations made by the chief priests and elders, Jesus gave no reply. Then Pilate asked him, “Have you no answer to make? Do you not hear how many charges they are bringing against you?” But Jesus said never a word, not even to answer a single charge, so that the governor was greatly astonished. 10. When Pilate heard Galilee spoken of, he asked whether the man was a Galilean. And when he learned that Jesus came under Herod’s jurisdiction, he sent him over to Herod, who was also in Jerusalem at that time. Many Jews of the time believed that entering the house of a gentile could make them impure for ceremonial purposes, particularly if they did so during a holy period. In John, Pilate says only “What is truth?” In this translation the word “truth” is given twice, to better convey the sense that Pilate spoke in cynicism and worldliness, rather than in an actual inquiry about truth. This is made clear in the next verse, when Pilate leaves without waiting for an answer. “Blessed are the poor and modest, for theirs is the kingdom of heaven. Blessed are they that hunger and thirst after righteousness, for they shall be satisfied. Blessed are you that hunger now, for you shall be filled. Blessed are you when men hate you, and when they exclude you and revile you, and falsely say all manner of evil against you for my sake. Rejoice in that day, and leap for joy, for behold, your reward in heaven is great; for so their fathers persecuted the prophets who were before you. 2. “You are the salt of the earth. But if the salt has lost its savor, how can it be made salty again? It is no longer good for anything except to be thrown out and trodden under foot by men. 3. “You are the light of the world. A city that is set upon a hill cannot be hid. Nor do men light a lamp and then put it away, or hide it under a bushel, but instead they put it on a lampstand, where it gives light to all that are in the house, so that those who enter may see the light. In the same way, let your light so shine before men, that they may see your good works and give glory to your Father who is in heaven. 4. “Do not think that I have come to abolish the law or the prophets; I have come not to abolish them but to fulfill them. For I tell you truly, until heaven and earth pass away, not even one letter, not a jot, will pass from the law until everything has been accomplished. Therefore, whoever relaxes even the least of these commandments and teaches others to do so, shall be called the least in the kingdom of heaven; but whoever practices and teaches these commandments shall be called great in the kingdom of heaven. 5. “For I tell you, unless your righteousness exceeds that of the scribes and Pharisees, you shall never enter the kingdom of heaven. 6. “You have heard that it was said to the people long ago, ‘Thou shall not kill; and whoever kills shall be liable to judgment.’ But I say to you that every one who is angry with his brother will be liable to judgment, whoever insults his brother as empty-headed will be liable to the council, and whoever curses, ‘You fool!’ will be in danger of the fires of hell. So if you are offering your gift at the altar, and there remember that your brother has something against you, leave your gift there before the altar and be on your way; first be reconciled to your brother, and then come and offer your gift. 7. “Try to come to terms quickly with your adversary, while you are still on your way to court with him, lest he drag you to the judge, and the judge hand you over to the officer, and the officer put you in prison. I tell you truly, you will never get out of there until you have paid to the uttermost penny. 8. “You have heard that it was said, ‘Thou shalt not commit adultery.’ But I say to you that whoever looks upon a woman to lust after her has already committed adultery with her in his heart. If your right eye causes you to sin, pluck it out and throw it from you; it is better for you to lose one of your members than for your whole body to be thrown into hell. And if your right hand causes you to sin, cut it off and throw it from you; for it is better for you to lose one of your members than for your whole body to go into hell. 9. “It was also said, ‘Whoever shall put away his wife, let him give her a certificate of divorce.’ But I say to you that every one who divorces his wife, except on the ground of unfaithfulness, makes her an adulteress; and whoever marries a divorced woman commits adultery. 10. “Again you have heard that it was said to those of old time, ‘Thou shalt not swear falsely, but shall perform unto the Lord thy oaths.’ But I say to you, Swear not at all, neither by heaven, for it is God’s throne, nor by the earth, for it is his footstool, nor by Jerusalem, for it is the city of the great King. And do not swear by your head, for you cannot make one hair white or black. Let your word be simply ‘Yes’ or ‘No’; anything more than this is born of evil. 11. “You have heard that it was said, ‘An eye for an eye, and a tooth for a tooth.’ But I say to you, Resist not evil. If any one strikes you on the right cheek, turn the other cheek to him also; and if any one wants to sue you to take your shirt, let him have your coat as well; and if any one forces you to assist him for one mile, go with him two miles. Give to every one who begs from you, and do not refuse the one who would borrow from you. If someone takes what belongs to you, do not insist on getting it back. 12. “You have heard that it was said, ‘Thou shalt love thy neighbor, and hate thine enemy.’ But I say to you that hear me, Love your enemies, do good to those that hate you, bless those who curse you, and pray for those who mistreat you, so that you may be the children of your Father who is in heaven. For he makes his sun to rise on the evil and on the good, and sends rain on the just and on the unjust. 13. “If you love those who love you, what credit is that to you? Do not even sinners and tax-gatherers do the same? And if you do good to those who do good to you, what credit is that to you? For even sinners do the same. 14. “And if you are courteous only to your brethren, what are you doing more than others? Do not even the pagans do the same? And if you lend only to those from whom you can expect repayment, what credit is that to you? Even sinners lend to sinners, to receive as much in return. 15. “But love your enemies, and do good to them, and lend, expecting nothing in return; and your reward will be great, and you will be the children of the Most High; for he is kind even to the ungrateful and the selfish. 16. “Be perfect, therefore, even as your heavenly Father is perfect. 17. “Be careful not to practice your piety in front of men in order to be seen by them; for then you will have no reward from your Father who is in heaven. Therefore, when you give alms, sound no trumpet before you, as the hypocrites do in the synagogues and in the streets, so that they may be praised by men. Truly, I say to you, that will be their only reward. When you give to the poor, do not let your left hand know what your right hand is doing. Thus your giving will be in secret; and your Father who sees even what is done in secret will reward you. 18. “And when you pray, do not be like the hypocrites; for they love to stand and pray in the synagogues and on the street corners, so that they may be seen by men. Truly, I say to you, that will be their only reward. But when you pray, go into your inner room and shut the door and pray to your Father in secret; and your Father who sees what is done in secret will reward you. 20. “For if you forgive others their trespasses, your heavenly Father will also forgive you; but if you do not forgive others their trespasses, neither will your Father forgive your trespasses. 21. “And when you fast, do not be of a somber countenance, like the hypocrites, for they neglect their appearance to show men they are fasting. Truly, I say to you, that will be their only reward. But when you fast, anoint your head and wash your face, so that your fasting will not be seen by others but only by your Father who is unseen; and your Father who sees what is done in secret will reward you. for you have already had your comfort. for you shall go hungry. for so their fathers treated the false prophets. 23. “Do not lay up for yourselves treasures on earth, where moth and rust corrupt and where thieves break in and steal, but lay up for yourselves treasures in heaven, where neither moth nor rust corrupts and where thieves do not break in and steal; for where your treasure is, there your heart will be also. 24. “The eye is the lamp of the body. So, if your eye is clear, your whole body will be full of light; but if your eye is not sound, your whole body will be full of darkness. Therefore be careful lest the light within you be darkness. For if the light in you is darkness, how great is that darkness! But if your whole body is full of light, having no part dark, it will be wholly bright, as when the bright shining of a lamp shall give you light. 25. “No man can serve two masters; for either he will hate the one and love the other, or he will be devoted to the one and despise the other. You cannot serve both God and mammon. Therefore I tell you, do not be anxious about your life, about what you shall eat or what you shall drink, nor about your body, what you shall put on. Is not life more than food, and the body more than clothing? 26. “Consider the ravens, and the birds of the air: they neither sow nor reap, nor do they gather the harvest into storehouse or barns, and yet your heavenly Father feeds them. Are you not of more value than they? Yet which of you by being anxious can add a single hour to his span of life? And if you are not able to do even so small a thing as that, why are you anxious about the rest? 27. “And why be anxious about clothing? Behold the lilies of the field; consider how they grow. They toil not, neither do they spin; yet I tell you, even Solomon in all his glory was not arrayed like one of these. But if God so clothes the grass of the field, which today is alive and tomorrow is cast into the fire, will he not much more clothe you, O ye of little faith? 28. “Do not be of anxious mind, saying ‘What shall we eat?’ or ‘What shall we drink?’ or ‘What shall we wear?’ For all the nations of the world are eager for these things; and your heavenly Father knows that you have need of them all. But seek first his kingdom and his righteousness, and all these things shall be added to you as well. 29. “Therefore do not worry about tomorrow, for tomorrow will worry about itself. Sufficient unto each day are the troubles thereof. 30. “Be merciful, even as your Father is merciful. 31. “Judge not, that ye be not judged; for by the rule you apply to others you will be judged yourself. Condemn not, and you will not be condemned. Forgive, and you will be forgiven. Give, and it will be given to you. A good measure — pressed down, shaken together, running over — will be put into your lap. For the measure you give will be the measure you receive in return. 32. “Why do you see the speck of sawdust that is in your brother’s eye, but do not notice the whole chip of wood that is in your own eye? How can you say to your brother, ‘Brother let me take out the speck that is in your eye,’ when all the while there is a chip in your own eye? You hypocrite, first take the chip out of your eye, and then you will see well enough to take the speck out of your brother’s eye. 33. “Do not give to dogs that which is holy; and do not cast your pearls before swine, lest they trample them underfoot and turn to attack you. 34. “Ask, and it shall be given to you. Seek, and ye shall find. Knock, and it shall be opened unto you. For every one who asks receives, and he who seeks finds, and to him who knocks the door will be opened. 35. “Which one of you, if his son asks him for bread, will give him a stone? Or if he asks for a fish, will give him a serpent? If you then, who are evil, know how to give good gifts to your children, how much more will your Father who is in heaven give good things to those who ask him? 36. “So in all things whatsoever, do unto others as you would have them do unto you, for this sums up all of the law and the prophets. 37. “Enter by the narrow gate. For wide is the gate, and broad is the road that leads to destruction, and many are those who enter through it. But strait is the gate, and narrow is the way which leads to life, and few there are that find it. 38. “Beware of false prophets, who come to you in sheep’s clothing, but inwardly they are ravening wolves. 39. “You will recognize them by their fruits, for every tree is known by its own fruit. Are grapes gathered from thornbushes, or figs from thistles? Every sound tree bears good fruit, but the rotten tree bears bad fruit. A good tree cannot produce bad fruit, nor can a bad tree produce good fruit. Every tree that does not bear good fruit is cut down and thrown into the fire. Therefore by their fruits you shall know them. 40. “The good man out of the good treasure in his heart brings forth good, and the evil man out of the evil treasure in his heart brings forth evil. For it is from the contents of the heart that the mouth speaks. 42. “Every one who comes to me and hears my words and follows them, I will tell you what he is like: he is like the wise man building a house, who dug deep, and laid the foundation upon the rock. The rain fell, and the floods came, and the winds blew and beat upon that house, but it did not fall, for it was founded upon a rock. 44. When Jesus finished saying these things, the crowds were astonished at his teaching, for he taught them as one who had real authority, and not as their scribes. By this Jesus promises to uphold at least the true spirit of the Law of Moses, which provided instruction on ethics, sacrifices, and religious conduct generally. Jesus had grown up within the Jewish tradition and had absorbed those rules. Later, however, he would set aside or reinterpret some of the more arbitrary rules, such as the kosher rules of diet, see Chapter 84:7, thus beginning the break between Christianity and Judaism. Some manuscripts add the qualification “without cause” at this point. However, the unqualified instruction seems more in keeping with the rest of the sermon. These last two lines are a doxology — a short hymn of praise added at the end of a longer prayer. These particular lines appear in many editions of the Bible in footnote, because they come from later manuscripts. Some denominations include them in their services as part of the Lord’s Prayer, others recite them separately from the prayer itself, and still others use a variant wording. 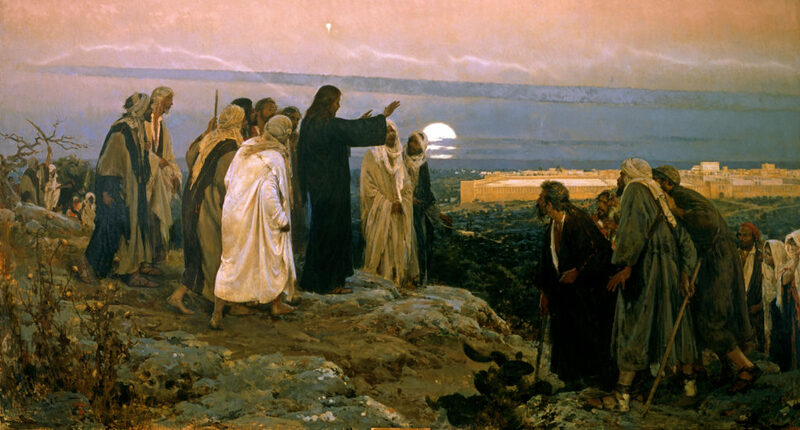 Web page illustration: “Flevit Super Illam” by Enrique Simonet. Photo: Album / Art Resource, NY.